If you haven’t gotten your asparagus yet, this is the very last week! Zen Jones will be at tending my booth at market with Certified Organic Asparagus. Thank You! Sorry to say that we won’t have any microgreens this week. seat to continued field work of planting, watering, and yes . . .
in this week, young and tender leaves from many varieties. New! Pastured Chicken– First batch of the season ready! We sell by halves and quarters! We have beef hanging at Graham’s Organics! Ask us for more details if interested! Beef should be available on June 20. Please note: At this time we may not be able to attend this week. Rigatoni in Lemon Pepper & Tomato Basil! Not only will we be at Sweetwater with our cold-pressed juices and Switchel, we will also be selling CULTURED LOVE’s specialty krauts! We’re bringing extra this week because we won’t be able to be at market again until July 14. Otherwise, Nature’s Helping Hand will be fully stocked for your convenience. Find them at 4543 Grand Haven Road, south of the Cinema and just north of Hile Road. They’re open Monday, Wednesday, and Friday from 10-5 and Tuesday and Thursday from 10-7. Call first if you’re coming from far away because she will be closed one week of the summer ((231)557-5691. You can also contact me by email at: neverbetternaturals@gmail.com or by phone/text at: (231)828-5227. Special deal! $5 in market bucks to the first 10 customers who stop by our info booth and solve this week’s puzzle! Two vendors will be bringing alfarawila to the market. What is it and should you come early if you want some? We have an open house to plan for, won’t be at market this week. My Shitake and Oyster Mushrooms will not be ready in time for the market on Saturday. Expect to be back with goods on the 16th. Please note: We will not be at Market this Saturday, June 9th, see you next week. We’ll be back in a few weeks, once the veggies in the field have sized up a bit. In the meantime, enjoy these beautiful summer days! 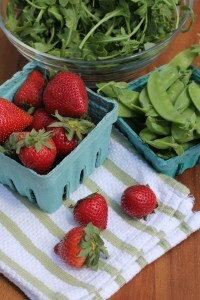 Tagged with First week for organically grown Strawberries!, Last week for Certified Organic Asparagus!